Tina Pendlebury is the Regional Education Officer of the Midwest Branch of Cancer Council WA. After growing up in Albany Tina moved to the north of WA spending 12 years in Broome and Derby. In 2008 Tina and her husband moved to Geraldton to start a family and have been here ever since. The time spent in the north was pivotal in shaping her study of Health promotion through Curtin University. Tina is now on a mission to make the healthy choice the easy choice, and to help people enjoy a healthier life through education and environmental changes. (Lucky today was not a bacon and eggs day!-ed) In her spare time she enjoys gardening, cooking and being involved in community. A past Rotarian she also hopes to become involved again in the future. 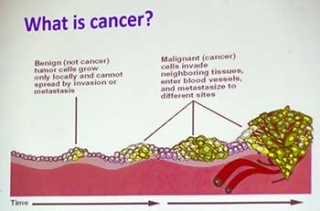 The Vision of the Cancer Council of WA is to achieve a cancer free future for our community, and the Mission is to work with our community to reduce the incidence and impact of cancer. Tina went on to outline the work the Council does in promoting prevention, education and research funding, as well as providing advocacy and counselling for cancer sufferers and their families. 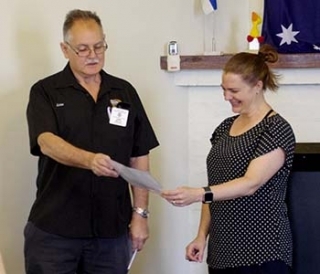 The Council also assists with accommodation in Perth for country patients, wig services and supports volunteer programs, funding events and palliative care programs. In the Midwest April Kalajzich and Elizabeth Jenkinson are the cancer support co-ordinators, and Tina the regional education officer. 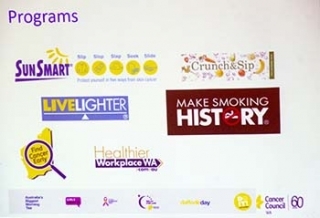 Tina’s core areas include education in nutrition and healthy lifestyle, physical activity, tobacco control, sun protection, the find cancer early program and cancer screening programs, including bowel, breast and cervical screening and to raise awareness of the five most common cancers, bowel, lung, prostate, breast and skin. The take home message: Get unusual symptoms checked out early and see your GP! No excuses! Both Hugh Lavery and later, officially, Lew Hills, both cancer survivors themselves, thanked Tina for her excellent presentation. Tina was the first of our guest speakers to be presented with our “End Polio Now” thank you certificates.